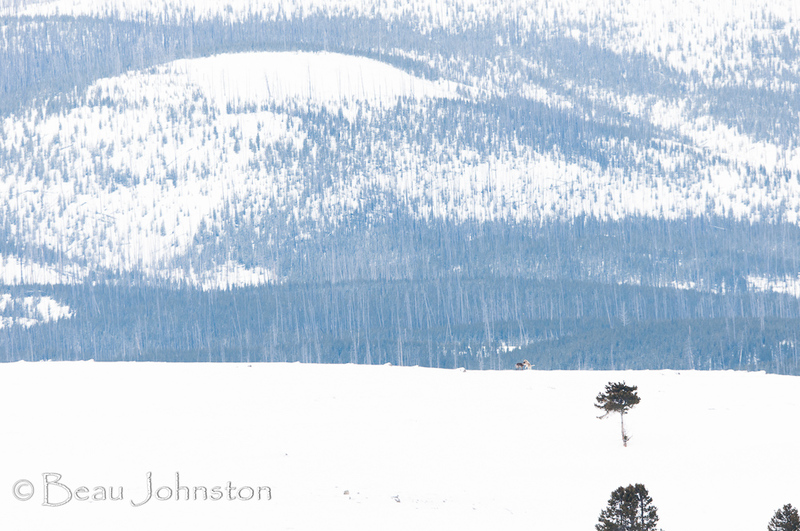 Winter in Yellowstone is not for the faint of heart or for the coldblooded. 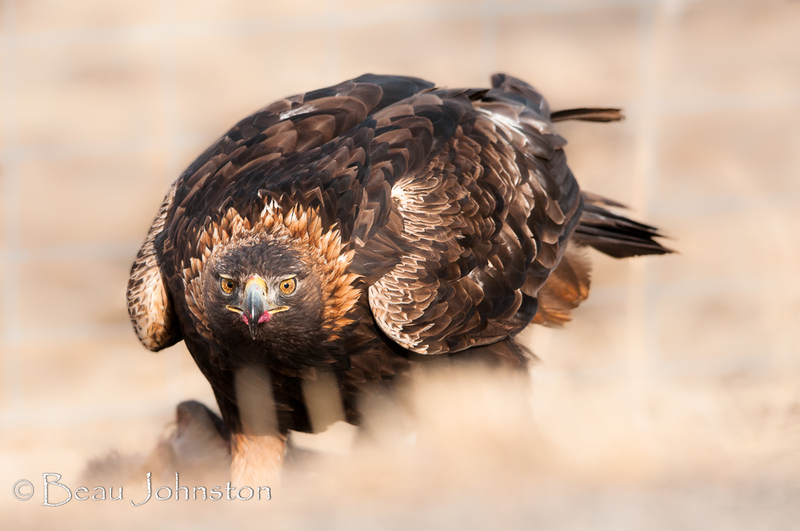 We arrived at the North Entrance on a Friday in late February and were excited to spend a long weekend driving between Gardiner, MT and the Lamar Valley area to photograph wildlife. The North Entrance to the Park is the only one open to passenger vehicles during winter. The poor folks that live in Cooke City, MT, at the Northeast Entrance to Yellowstone, must travel through the Park in winter to leave town as the only other road leaving town, the Beartooth Highway, shuts down for winter weather until Memorial Day. Once in the Park we saw the requisite elk, antelope, and bison just inside the entrance. 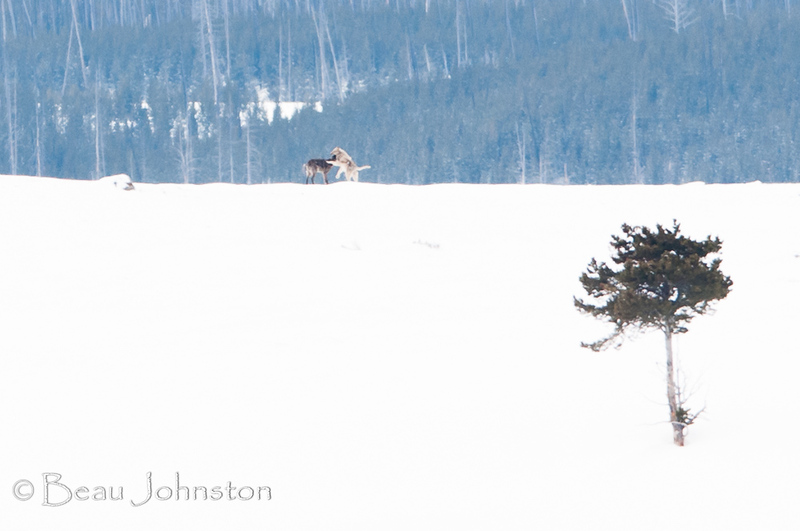 For the most part, those people visiting the Park in the winter are frequent Yellowstone visitors in pursuit of lesser seen animals, so we were fortunate to have the park mostly to ourselves. 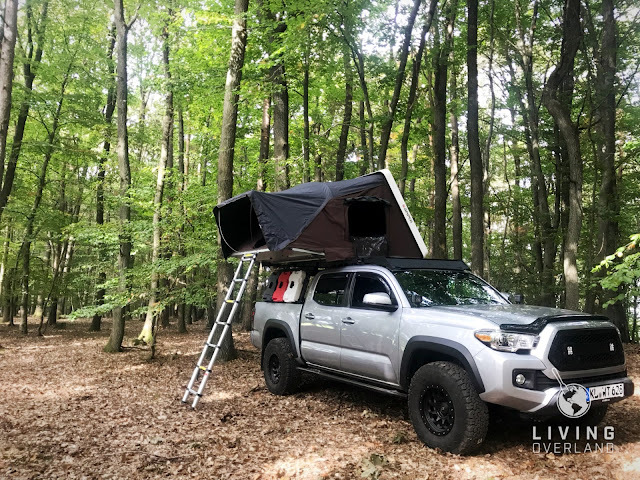 It was quiet, sometimes you wouldn't see another vehicle for 15 or 20 minutes; that never happens any other time of year! Our first stop was where a few vehicles were congregated alongside the road at the “S-curve” just below the Blacktail cross-country skiing trail. Folks were out with their spotting scopes glassing for wolves that were about two or three miles away. The wolf watchers mentioned the pack of at least five had been closer to our location the previous day, but at two plus miles away the wolves, when visible, were just dots in the nice Bushnell binoculars I was using. Here they are, and they are playing! Moving onward, realizing that we wouldn't be seeing any wolves in the near future, we drove until we made it to the confluence of Soda Butte Creek and the Lamar River, but along the way we hadn't seen any notable signs of non-standard wildlife or heard of any places where wolves had made a kill. Sitting in a parking spot where we had a good view of Soda Butte Creek and the surrounding valley and hillside, we decided to sit and watch hoping to see some wildlife hidden among the lower-than-average snow pack and sagebrush. A few minutes later while watching some ducks playing on the creek I spotted a snow and sagebrush camouflaged coyote. After pointing him out to Beau, we realized there were actually two of them; they meandered down the creek bed and occasionally he’d mate with her. 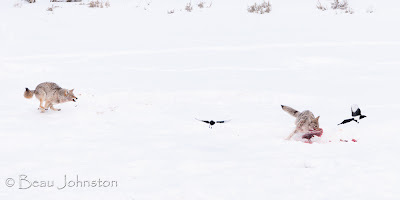 Leaving the twosome, we headed back through Lamar Valley and headed back toward the S-curve and came across two coyotes in an opening where we normally see bison wallowing in marshes during the spring and summer. Only about 50 yards from the road, one coyote was gnawing on what looked to be a large rabbit while the other coyote and a few crows and magpies patiently waited for a piece of the bounty. 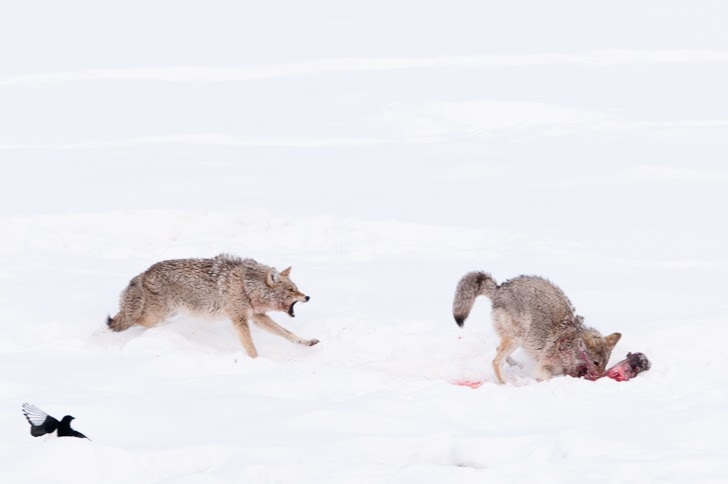 After waiting patiently for what have must have felt like hours, the second coyote decided that patience is not a necessary virtue for a coyote. 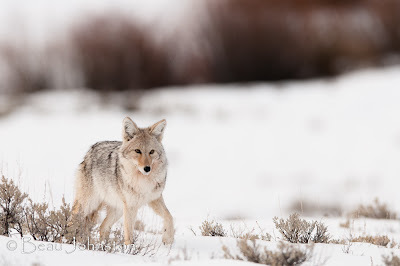 She circled around the back of the first coyote, rushed at him and jumped on his back while nipping at his flanks. Her maneuver was successful in splitting the carcass in two and proving a meal for both coyotes. The pair leisurely ate their meal in the sun, only interrupted by the birds hoping for a handout. After the female finished her meal she meandered up on top of a boulder and sat upright, with her belly distended, waiting for the male to finish his meal. Upon returning to our hotel room that night, Beau looked at the photos of the coyotes and we quickly realized that they were not eating a rabbit; we saw a snout, ears, and a long leg with a hoof, and came to the conclusion that this was a bison calf that was unfortunately miscarried because its mother was infected by brucellosis. Throughout the weekend we’d find wolf watchers grouped alongside the road in different areas; we’d stop to see what they were looking at, but for the most part they’d be looking at wolves that were miles away. We've been fortunate in our wildlife viewing opportunities and have seen wolves from less than 50 yards away, so it was hard to get excited about wolves that were only dots in high power spotting scopes. 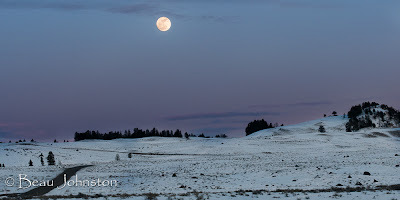 At one point we stopped near the bison ranch in Lamar Valley because a pair of wolves had been seen approximately ½ mile away about a half hour previously. Getting out my trusty binoculars I started looking across the mountainside for signs of the pair. About 10 minutes later, I spotted a light gray colored wolf trotting across the snow. I told Beau and the others in the group that I had seen the wolf and trying to figure out where the wolf was located in relation to other items on the hillside, I oriented myself and could excitedly blurted out “it is chasing after the elk!”. 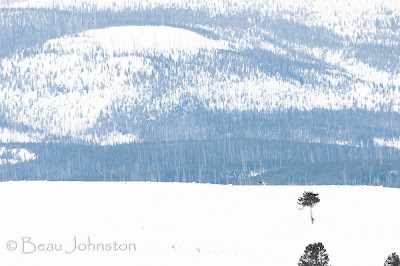 The wolf struggled chasing the pair of cow elk but quickly lost headway as the snow collapsed under the weight of each step. The elk leisurely trotted up the hillside as the wolf, resigned to the fact that he’d be hungry a while longer, met up with his mate and headed in the opposite direction of the elk into the mountains. A big horn sheep ram smiling as he warms himself in the morning sun. Wildlife viewing opportunities were somewhat limited on this trip, perhaps due to the much lower than average snow pack, but also due to the random intermittent blizzards leaving us with minimal visibility. 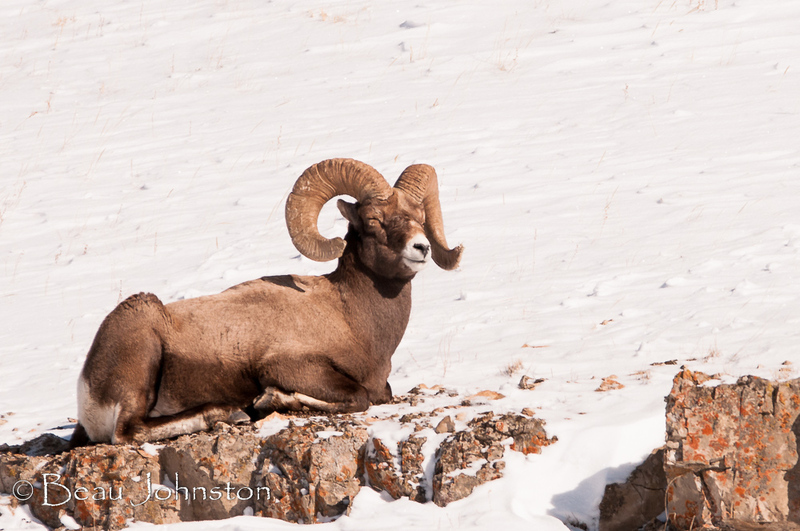 Other wildlife we enjoyed seeing while on the trip included lots of bighorn sheep grazing on exposed grass and a couple of golden eagles, one of which was feasting on a duck it plucked from the Lamar River. Surprisingly, watching bison and their antics was one of my favorite parts of the trip. To find food the older bison would sweep the snow off the grasses by moving their heads from side to side in a Stevie Wonder-type fashion. 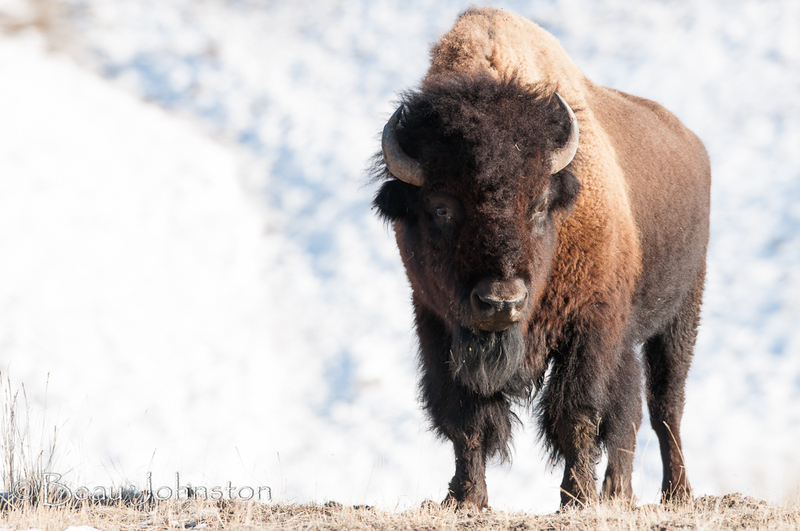 The young bison were still nimble and dexterous enough to remove the snow using their front feet. While looking down into Lamar Valley you could see the paths that the bison made while searching for food—completely random, much like the path of a ball in a pinball machine. Yellowstone Bison from Living Overland on Vimeo. All in all, it was a good trip. We saw lots of wildlife many people never have the opportunity to see, contended with lots fewer people than normal, met some great folks along the way, and realized it was a small world filled with great people when we randomly ran into someone we hit it off with on our fall 2012 Yellowstone trip.